The printed menu at Pho Dollar (322 W. Ferry St., 768-0049) is among the worst I've ever seen, in terms of the chasm between its physical form, set in brutally small type, and the undiscovered glories it conceals. So here's a guide, in pictures and words, to my meals there, with handy dish numbers for easier ordering. Check out the full review in Thursday's Buffalo News. 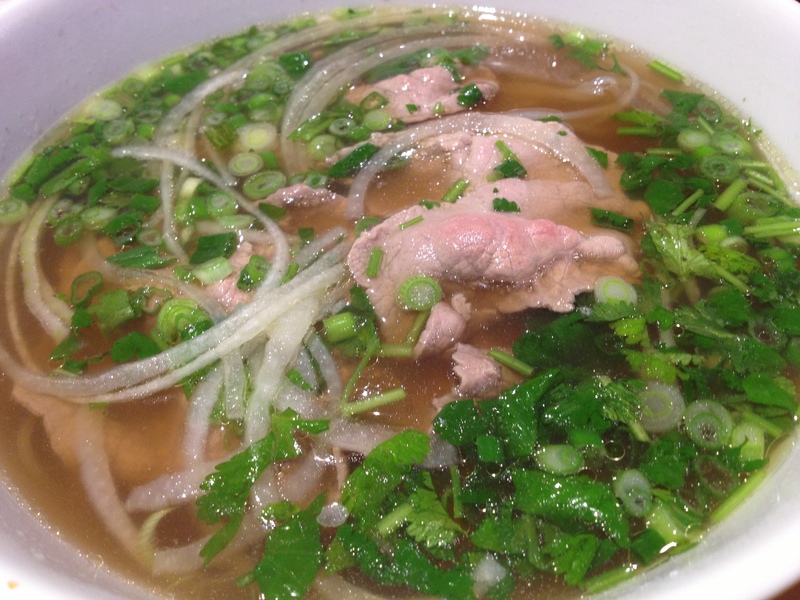 The pho at Pho Dollar is good, as in the pho tai above ($8.95, No. 23), but I didn't think it was better that 99 Fast Food. That said, most of the broad variety of dishes we tried beside the pho outshone 99 Fast Food, and every other Vietnamese place in town. Check out No. 5, goi ga ($9.95), a cool salad of shredded cabbage, carrot, poached chicken, fried shallots and ground peanut, plus fresh herbs like mint and basil, in a lime-fish sauce dressing. Light, crunchy, delicious. Then there was the bo luc lac (No. 10, $11.95), known other places as "shaking" beef, medium-chewy beef bites in a sweet, caramel glaze on a sizzle platter, with onions, bell peppers, and yep, a slab of butter. When an intrepid crew of six took on the menu a couple of weeks ago, the first dish out was No. 1, chao tom dac san cua Dollar ($11.95). It's a spring roll kit, centered around ground shrimp sausage that's been shaped around sugarcane sticks, fried, and then sliced. You dip a disc of rice paper in the proferred bowl of hot water, then wait a few seconds for it to soften, then roll your own, stuffed with rice vermicelli, sausage, salad fixings, and anything else on the table that looks good. The fried egg rolls (No. 4, cha gio, $4.25), pictured below, were OK, but I like Fast Food's peppery, porky version better. Another wow-inducing dish was No. 11, bo nuong xa ot ($8.95), slices of tender beef wrapped around chile-spiked onions and lemongrass, grilled and glazed. Spicy but most of the crew braved the burn to get another bite. There's a few dishes on the menu that are listed as a seafood, "scallions and butter." At our visit the kitchen was out of fresh crab and lobster, but they could make the calamari version (No. 90, muc rang bo, $12.95). It was expertly fried squid in a spicy crunchy coat, that had been wokked a second time with aromatics like onions, scallions, and tossed in butter. It was awesome, and would kill you if you made it a regular thing. There are clay pot casseroles with caramel sauce ("kho"), and we tried the pork version (No. 85, thit kho to, $11.95). It was tender meat in a rich, sweet, salty sauce with lots of toasted garlic chips. Like the calamari, it's designed to be eaten with mounds of white rice. Another surprise hit was a bowl of soup big enough for a table, canh chua ca hoac tom (No. 83, $14.95). It was a tangy sweet-sour pineapple broth with catfish, okra, tomatoes, bean sprouts and herbs. Sounds wierd. Tastes great, except for the crunchy tomates, but it's February. The house special rice vermicelli with mixed toppings was decent, and the grilled pork was worthy (No. 52, bun dac biet Dollar, $11.95), but there were more interesting things on the table. The house special stuff on rice (No. 44, com dac biet Dollar, $11.95) got a similar reception. There sure were interesting things on the plate, including an excellent ham-steak-like pork chop, plus a sort of baked pork pate, but drier. It was quite a meal, and I'm pretty sure there's another half-dozen gems on the menu I just haven't found yet. I would welcome your scouting report at agalarneau@buffnews.com.